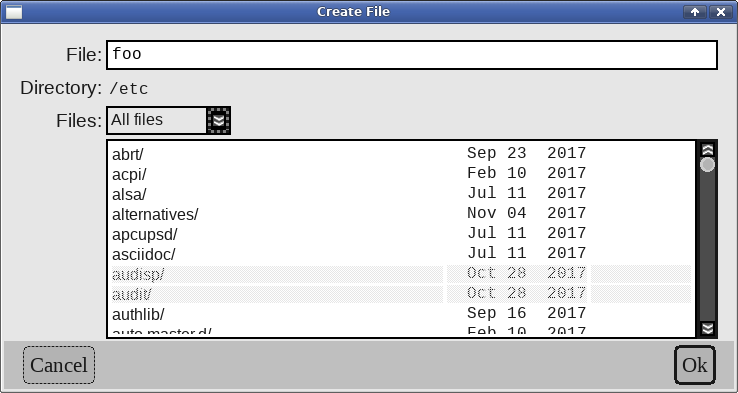 menu.C from Chapter 24, Menus gives an example of presenting a file dialog, a basic interface for opening or creating a file. Main window's create_file_dialog returns a new x::w::file_dialog object. menu.C creates two file dialogs, for its “File/New” and “File/Close” menu options. x::w::file_dialog_config configures a new dialog. Its first two parameters are callable objects. The first one gets executed when a filename gets selected by the dialog, in one of two ways: typing in the filename manually followed by “Enter”, or clicking the “Ok” button; or double-clicking on an existing file in the list of shown files. It's also possible to use the system file managers to drag an icon for a file into the file dialog and drop it on top of the file directory listing (anywhere except for the filename field, which is a text input field that only accepts dropped plain text content. Dropping a file icon is equivalent to typing in its filename, followed by “Enter”. The dialog does not get automatically closed, but the first parameter to the lambda is the x::w::file_dialog, in case it should be hide()-en. The second lambda gets executed if the file dialog gets closed for any other reason (“Cancel” button, Esc, or using the dialog window's close button, if one is provided by the window manager). The third optional parameter defaults to x::w::file_dialog_type::existing_file. The first field in the file dialog is an input field for typing in a filename directly. Below it is the name of the current directory displayed by the file dialog. Each component in the directory's name is clickable, and shows the list of files and subdirectories below it. A combo-box with filename filters appears between the current directory's name, and the contents of the directory. This limits the list of files shown below to only the filenames that match the filename filter pattern. The label shown in the combo-box, a x::w::text_params, or a plain text string. The regular expression that a filename must match, in order to be visible. Note that this is a regular expression, and not a simple filename pattern. The above example adds two more filters to the vector, and sets the initial_filename_filter, that's shown initially when the dialog opens, to “Text files” (index #0 is the default “All files” option). create_file_dialog()'s first parameter is a dialog setting parameter. The second parameter is the initialized x::w::file_dialog_config.